Our lovely friends Liam & Ali are the faces behind Bilby the Bus! Their crazy journey began in September 2016 when they picked Bilby, then a white and red 22 seater mini bus. Fast forward 8 months when they both resigned from their jobs, finished their university degrees and headed off on the adventure of a life time! We were lucky to catch up with them this week to find out more about their life & passion for travel! YoHome: So for those who don’t know you two wonderful people – please introduce yourselves? 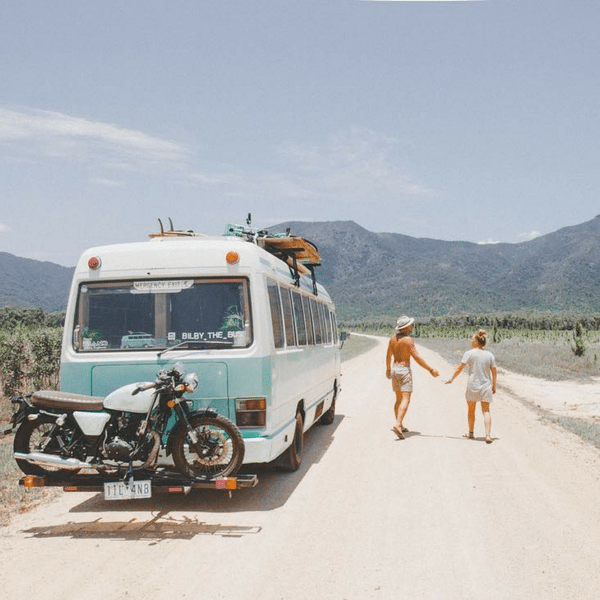 Liam & Ali: We are Liam and Ali, both 24 year olds from Melbourne, both commerce graduates and we are travelling around Aus in a converted school bus. YoHome: What influenced your decision to abandon the 9 – 5 routine and embrace the bus life? Liam & Ali: We both needed a break after finishing our uni degrees and didn’t want to jump straight into corporate jobs. We wanted to travel for a long time without spending huge amounts of money; we knew Europe and America would mean expensive quick holidays so we decided we’d do something different. We both loved adventure and the outdoors so we decided to cruise Australia’s great coastline, to surf and swim everyday and find beautiful locations for as long as our money allowed (which so far has been 4 months). YoHome: Where did the name Bilby come from? YoHome: How long did it take to convert Bilby the Bus? Liam & Ali: We bought Bilby as a 22-seater school bus and it took us roughly 6 months to convert him into our home. We used mostly recycled timber for the interior and painted the exterior ourselves. It was a very fun process and a real labour of love that we managed to do on the cheap. YoHome: Your top 5 camp spots in Aus? great at regulating temperature making these T’s the perfect travel companion! YoHome: Most “life changing” travel moment? Liam & Ali: The whole trip has been life changing, it’s hard to pin point one exact moment. Some incredible experiences we’ve had would be Swimming/surfing 100 metres from a breaching whale in North Stradbroke island, cruising through the Whitsunday islands, climbing and sliding down pure white sand dunes in Minnie water, All the incredible experiences you have really add up. YoHome: How does a beautiful Sunny day look for you two compared to rainy days? Liam & Ali: A beautiful sunny day always begins with coffee as the sun comes up, and then either relaxing on the beach, exploring our current location (hiking, running, motorbike riding), surfing and swimming or lazing around with a good book in the hammock. Sunny days are definitely more enjoyable. But having a bus means we have a lot of room when we get cooped up on rainy days: We pop the awning out so we can still sit outside if its hot and humid, or rug up inside and watch a movie. We try not to let the rain stop us though, so a lot of the time we’ll still go exploring and swimming. YoHome: What is your favourite part about bus life? Liam & Ali: Our ever changing view, the freedom that comes with this form of travel and the ability to get back to basics and enjoy the little things. Everything we do takes just that little bit longer. You really appreciate things a lot more. It’s so lovely to sit and enjoy a coffee every morning by the beach, instead of drinking a crap coffee out of a takeaway cup on the way to work. The freedoms of never having to be somewhere by a certain time is something we love. We have a little saying that we are ‘Rich with time’. We have the choice to do whatever we want, whenever we want and it’s great. There were so many things we wanted to be doing more of when we were working that we now can do, like surfing and painting. YoHome: What is your funniest story from being on the road? Liam & Ali: There’s quite a few! A recent one was when a huge huntsman came out of our Aircon in the bedroom one night and we couldn’t get it out so we eventually slept on the floor the whole night because we were such chickens. You definitely have to try to find the humour in many situations; things don’t often go to plan. YoHome: What do you love about most about each other? Liam & Ali: I think how relaxed we both are, nothing ever really phases us and we don’t often get stressed about things. It makes for a much more enjoyable time being locked up in the bus together when we both get along so well. We also both love the ocean, which means spending a day doing nothing by the ocean is really wonderful together. YoHome: What is the feeling of home for you? Liam & Ali: I guess for us home will always be Melbourne, but it’s nice to think outside the box, and see how other people are living and know that we can always stop somewhere along the way that looks like a fun place, and spend a few months. It is hard being away from family and friends though so for us we like the idea of being able to go home, catch up with people and then go off again. YoHome: If you had to move into a more conventional home tomorrow, what aspect of your bus life would you absolutely miss the most? Liam & Ali: The ever-changing bedroom view for sure! Its so incredible being able to wake up in different locations all the time. We’d also miss the simplicity of this lifestyle, youre more inclined to learn new things and try new things when you have so much time to yourself. YoHome: If you could offer any advice to a new vandweller, what would it be? Liam & Ali: Make sure you build something that is comfortable, that takes very little effort to set up. If you’re going to be spending a lot of time on the road, then the last thing you want is to have to set up beds or go to a lot of effort each night and each morning. These sort of set ups are really great for weekenders or grey nomads who plan to be in one spot for a long time. We find that we set up camp and after a day we want to see more than what is directly around us. We’re luck we have our little motorbike to go off but often its nice to go to a secluded beach for a picnic and you want your fridge and kitchen with you for that. I guess also making sure you are prepared for the journey, financially and mentally. We left with a large lump sum and have gone through it pretty quickly with a few things that we got wrong. If we’d spent a little bit more time getting the build right then we could’ve saved ourselves a few extra bucks I recon. Mentally it is tough, there are hard times, times spent sleeping on the side of the road in service stations, or toilets that are far from pleasant. There is sand everywhere, all the time. Bugs love being inside the nice warm bus and you need to be okay with that. YoHome: In 5 years time we will be..
Liam & Ali: Having now lived the “vanlife” for a few months, I’d like to think we will still be travelling around the country in the bus. There are also other plans of perhaps doing a similar thing in another country. Or maybe a tiny home on a block by the beach somewhere. The one thing that’s for sure is I don’t think we will be living a normal, suburban, brick house life style anytime soon. A massive thank you to Liam & Ali for taking the time to chat to us & giving us a sneak peek into their incredible life & journey! Be sure to check them out on social media & keep an eye out for more interviews like this coming up in the very near future!